Summary: Electrical Circuits Question: I just bought a dryer without realizing that I did not have a 30 amp outlet/breaker in my apartment (I realize this was a silly oversight, yes). I just bought a dryer without realizing that I did not have a 30 amp outlet/breaker in my apartment (I realize this was a silly oversight, yes). All I have in my apartment are standard outlets as well as one 50 amp outlet for our electric range (in use). Since I don't own the property, I can't get any of the outlets converted. Are there any type of converters with some sort of surge protection/circuit breaking device built in that would allow us to use the same outlet for the dryer that we use for the stove (switching them off as needed) or do we just need to return the dryer and give up? 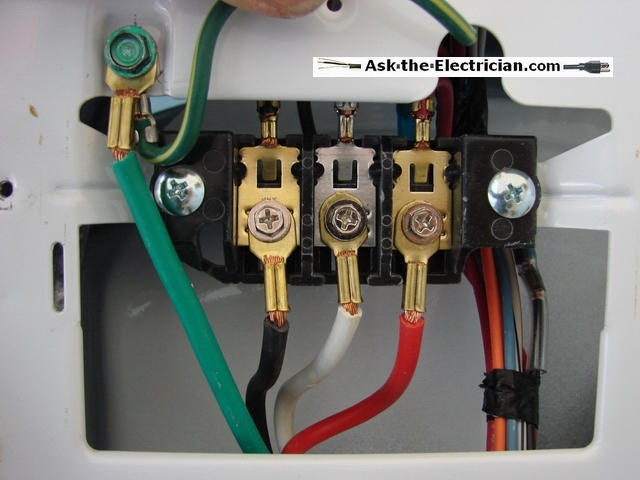 Hi Rachel - Great Electrical Repair Question! If the 50 amp range plug is near the dryer then here is one solution: Identify and shut off the 50 amp range circuit. Remove the 50 amp range plug and install a four circuit sub-panel that would now be fed by the original 50 amp range circuit. Now feed two 240 volt circuits from the new sub-panel, one 50 amp circuit for the range plug and one 30 amp circuit for the dryer plug. Although this would not be the most ideal arrangement, it would work except that you may trip the 50 amp sub-panel circuit if you were using both circuits at the same time. You would have to weigh the costs and the trouble to do this and decide if it is right for you. Keep in mind that the sub-panel would have to be properly grounded and in turn bond the grounds of the two circuits as well. The wire sizes will need to be maintained for the range circuit and the dryer would be 10 gauge copper conductors. I don't know if the range circuit has a separate neutral wire, however most new dryers recommend a neutral to be installed, but some do provide instructions about how to connect to a 3 wire - no neutral circuit. Understand that you really should get the approval from the apartment manager to do this. Also - dryers require an exhaust ventilation system, there is an indoor adapter that can be purchased which uses a water style lint trap. Keep in mind that there will be an accumulation of moisture, lint and heat in the dryer location. The code requires that an exhaust fan be installed in laundry rooms that do not have an opening window. You've been the only one to give me an option other than returning the dryer or installing an entire other line and outlet.